On Wednesday night, just past midnight I was woken by a loud banging. This was followed by the sound of something heavy being moved and thinking that someone might be removing the blocks protecting our newly laid driveway I went downstairs to investigate. Our neighbour’s outdoor light was on and my first thought that he too had been woken by the crashing noise. But no, he was the reason for the disturbing sounds. I am not sure what he was moving as I cannot see clearly into his driveway, but he carried on for nearly half an hour, before starting his vehicle and moving it. This disruption to my sleep meant I woke up feeling groggy. I had a total of 6 hours and 53 minutes of sleep and only 83% of it was restful. Meaning that the actual time I spent getting good sleep was 5 hours and 42 minutes. This resulted in the sleepy feeling persisting throughout the day and was not helped by eating potato salad at lunch time. I felt lazy the entire day but that did not stop me from getting all my errands run. It did however prevent me from wanting to do much more than watch TV when I got home. Supper was a simple salad, served with Mandy’s salad dressing and braaid chicken pieces. Being a chronic insomniac…I wish I had that much sleep. To me that sounds like a really good night, minus the noise lol! Great dressing, love the ginger touch in there too. Why does my mind go straight to the scene of a murder mystery TV show when I read this Tandy? Mmmm! I am loving this dressing. Bookmarked. Let me know when you make it! I. Want. This. Right. Now. This sounds like an awesome dressing, Tandy. I need to make it happen! So tasty and fun. That’s a very interesting dressing! Sun-dried tomatoes, ginger and orange have such bright and zesty flavors. When combined, it must taste amazing! This sounds like a great dressing! Lack of sleep must be going around. For some reason last night my dog woke me to go out three separate times. I am exhausted! Wow, way to stay motivated after all that ruckus. I would have probably just napped all day 😉 Salad dressing looks divine! That looks tasty! I love a recipe sweetened with honey instead of refined sugar too! I shall give this a go. Tandy, this sounds lovely. Wish my tummy could cope with those tomatoes! 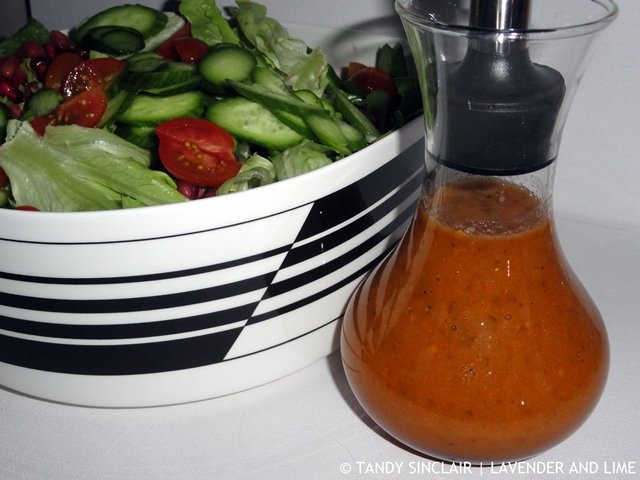 A sun-dried tomato salad dressing sounds wonderful and so full of flavour. I think this dressing looks absolutely yummy. I think I like the fresh ginger kick the best =) And I know exactly what you mean about sleep. I’m such a poor sleeper! I wish I didn’t get up 6 times a night to um, pee. It ruins sleep. I find if I don’t get 8 hours, I’m an absolute bear to live with. hehe. Just ask my kids. So I love the idea of a simply meal with yummy salad dressing on days like those. How lovely for you to feature a recipe from my blog Tandy, thank you so much. Always nice when someone can change a recipe to make it even nicer.